Taguig City was an area once devoted to agriculture. Its proximity to Makati City and the rest of Metro Manila has made it a popular location for businesses and commercial establishments. 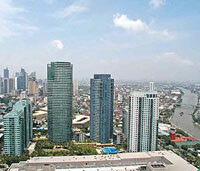 There are five different industrial centres and the Fort Bonifacio Global City in Taguig. Once a restricted area belonging to the Philippine Army, Fort Bonifacio has become a major business and commercial hub, just minutes away from central Makati. It has many high-rise residential condominiums, including an upscale "garden condominium" development, Serendra. South Forbes and Dasmariñas Village are right beside the Fort area. Fort Bonifacio is well-placed; it is next to the major C-5 highway, and is connected to Makati and EDSA via McKinley Road. It is also near the airport. The Philippine Stock Exchange plans to relocate here, a Shangri-la Hotel is opening, and Deutsche Bank and HSBC offices are here, as are many IT buildings. Bonifacio High Street is at the centre of it all, a relaxing, open-air green walkway with a multitude of boutiques and open-air cafés. Serendra, besides its condominiums, also functions as a restaurant village; it also has spas, beauty services, and home decor stores. Some of the city’s international schools are in Fort Bonifacio, including the International School Manila, the British School, and the Manila Japanese School. Residential buildings are still going up within the Fort area, and large-scale commercial projects are in the development stage here. The Taguig Coliseum and Convention Centre, with a hotel, office building, shopping centre, food court, and serviced apartments, is being planned. St. Luke’s Medical Centre, the country’s best hospital, is building its second hospital here.